We have a natural tendency to find our “comfort zone” and then position ourselves firmly in place. If you are in a situation or lifestyle where you are perfectly capable of handling everything, you have stopped growing in your understanding of God. God’s desire is to take you from where you are to where He wants you to be. You will always be one step of obedience away from the next truth God wants you to learn about Him. You may experience a restlessness whereby you sense that there is far more you should be learning and experiencing about the Father. At times, this will mean that you should move to a new location or take a new job. It could indicate that you need a deeper dimension added to your prayer life. Perhaps you need to trust God to a degree you never have before. The fishermen could not remain in their fishing boats and become apostles of Jesus Christ. Abraham was seventy-five years old when God gave him his major life assignment. These men had to disrupt their comfortable routine in order to reach new heights in their relationship with their Lord. 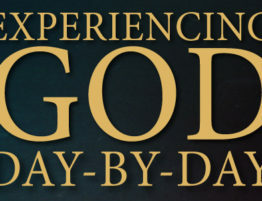 Likewise, in order to experience God to the degree He wants you to, there will be adjustments He will ask of you. Are you prepared for Christ to reveal Himself to you in dimensions that will change your life? Are you willing to abandon that which makes you comfortable?